Tired of sticky labels gumming up your office furniture, magnetic dry erase boards, and walls? Does writing on the office communication board make your hand cramp? Take control of your dry erase board—or any metal or magnetic surface—with StoreSMART's Window Frame Style Magnetic Document Holders! 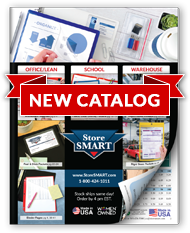 This convenient 8 5⁄8" x 11 5⁄8" size is perfect for labeling metal doors and warehouse shelves, as well as incorporating 8 ½" x 11" printouts into your 5S or visual management displays. Each holder is open on the long side to make swapping paper labels a breeze, and designed to frame your content with an attractive ½" border. Color-code your information to bolster employee comprehension, or utilize a variety of shades to bring a touch of color to your next meeting. Overall size: 10" x 13". Inside capacity: 8 5⁄8" x 11 5⁄8". Two ½" x 9" magnets on the back. Businesses: These Document Holders are great for posting 8 ½" x 11" documents as part of your Lean or visual management displays. Make sure project updates, critical data, and company reports are available for everyone to see. Teachers: These holders are a fantastic addition to your educational toolbox. Use them to create large, colorful magnetic dry erase board tiles to facilitate visual learning (e.g., number tiles for math learners, alphabet tiles for reading students). Homeowners: Use them to post and protect your family's calendar, emergency numbers, and other important information. Document Holder - Window Frame Style - Magnetic - Holds 1 ¾" x 6 ¼"